Queensburythe New York Army National Guard played host to 308 Boy Scouts, Scouters and Scout parents Sept. 29-Oct1 as the Turning Point District Scouts held a fall camporee at the armory. Scouts and Scout leaders got the chance to meet with Soldiers and learn more about the Army National Guard during a day of activities on Sept. 30. The Scouts got the opportunity to shoot M-16s on an electronic rifle range, learn about the equipmentlike the iRobot 510 Packbotemployed by the 1108th Explosive Ordnance Disposal Company, and chow down on MREs. Throughout the day, each Boy Scout Troop rotated through three main events; Weapons (the electronic range), archery, and climbing a rock wall, courtesy of Bravo Company of the New York Army National Guard’s Recruiting and Retention Battalion. Along with the physical activities that the scouts could do, they also had the chance to complete merit badges like First Aid. 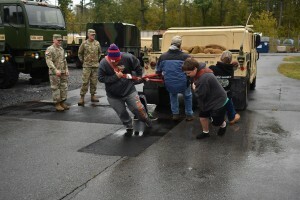 Scouts also engaged in a “Humvee Pull” to see which troops could pull a vehicle furthest and fastest. At the end of the day on Sept, 30, Scouts were recognized in an award ceremony. They also got a lesson in how to properly retire the colors at the end of the day. “I’d have to say, the educational aspect of it [was the best part], I really liked that,” said Scout Cameron Grover of Troop 6004, from Glens Falls. This event came together thanks to the work of Staff Sgt. William Valenza who has a history of working with the Boy Scouts, and Staff Sgt. Nick Scialdone, one of the recruiters. “[Staff Sgt. Valenza] knew about the camporee…and there was some talk back and forth because sometimes scouts will go into the military, so with the relationship of the Scouts and the Guard, it worked out perfectly,” Said Robert Bingham, the Turning Point District Commissioner. Valenza’s two sons, Mitchell and Andrew Valenza had both been a part of Boy Scouts and made it to Eagle. Valenza has worked with Scouts as a merit badge counselor prior to this event, and continues to contribute to scouting even after his sons had moved on, Bingham explained.